This is the output of a complete example run 10 of the branching model, including all complications you should ever hit. We start with the full history. In the following sections, we will take it apart to see what the commands do. So just take a glance, take in the basic structure and then move on for the details. Let’s take the log apart to show the actions contributors will do. (edit); hg ci -m "message"
Mind the tag field which is now shown in changeset 0 and the branchname for changeset 1. This is the only release which will ever be on the default branch (because the stable branch only starts to exist after the first commit on it: The commit which adds the tag). Now we just chuck along. The one commit shown here could be an arbitrary number of commits. If a hotfix has to be applied to the release out of order, we just update to the stable branch, apply the hotfix and then merge the stable branch into default11. This gives us changesets 4 for the hotfix and 5 for the merge (2 and 3 are shown as reference). hg ci -m "merge stable into default: ready for more development"
To do a regular release, we just merge the default branch into the stable branch and tag the merge. Then we merge stable back into default. This gives us changesets 6 to 812. The commit-message you use for the merge to stable will become the description for your tag, so you should choose a good description instead of “merge default into stable for release”. Userfriendly, simplified release notes would be a good choice. hg ci -m "merge default into stable for release"
hg ci -m "merged stable into default: ready for more development"
Now we want to do some larger development, so we use a feature branch. The one feature-commit shown here (x) could be an arbitrary number of commits, and as long as you stay in your branch, the development of your colleagues will not disturb your own work. Once the feature is finished, we merge it into default. The feature branch gives us changesets 9 to 13 (with 10 being an example for an unrelated intermediate commit on default). hg ci --close-branch -m "finished feature x"
hg ci -m "merged finished feature x into default"
Note: Closing the feature branch hides that branch in the output of hg branches (except when using --closed) to make the repository state lean and simple while still keeping the feature branch information in history. It shows your collegues, that they no longer have to keep the feature in mind as soon as they merge the most recent changes from the default branch into their own feature branches. Note: To make the final merge of your feature into default easier, you can regularly merge the default branch into the feature branch. Note: We use feature branches to ensure that new clones start at a revision which other developers can directly use. With bookmarks you could get trapped on a feature-head which might not be merged to default for quite some time. For more reasons, see the bookmarks footnote. The final action is to have a maintainer do a regular merge of default into stable to reach a state from which we could safely do a release. Since we already showed how to do that, we are finished here. This realizes the successful Git branching model13 with Mercurial while maintaining one release at any given time. multiple releases - if you need to provide maintenance for multiple releases side-by-side. grafted micro-releases - if you need to segment the next big changes into smaller releases while leaving out some potentially risky changes. explicit review - if you want to ensure that only reviewed changes can get into a release, while making it possible to leave out some already reviewed changes from the next releases. Review gets decoupled from releasing. All these extensions are orthogonal, so you can use them together without getting side-effects. With this merge-chain you don’t need special branches for releases, but all changesets are still clearly recorded. This simplification over git is a direct result of having real anonymous branching in Mercurial. 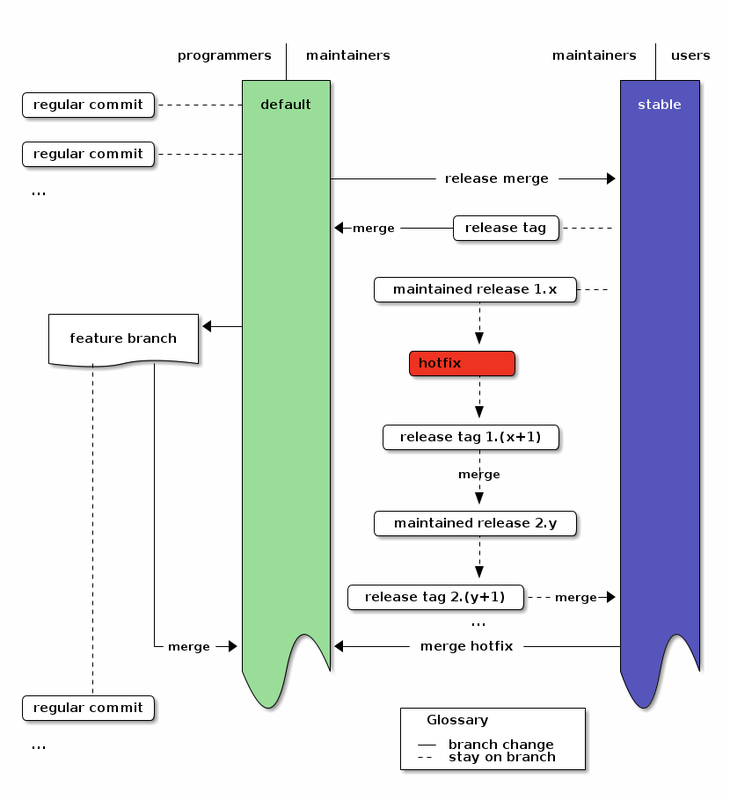 hg ci -m "merged changes from release 1.1"
In the Diagram this just adds a merge path from the hotfix to the still maintained releases. Note that nothing changed in the workflow of programmers. An overview of the branching strategy with maintained releases. Click the image to get the emacs org-mode ditaa-source. If you need to test parts of the current development in small chunks, you can graft micro releases. In that case, just update to stable and merge the first revision from default, whose child you do not want, and graft later changes15. You have changes 1, 2, 3, 4 and 5 on default. First you want to create a release which contains 1 and 4, but not 2, 3 or 5.
hg commit -m "merge stable into default. ready for more development"
Now you want to release the change 2 and 5, but you’re still not ready to release 3. So you merge 2 and graft 5.
hg commit -m "merge all changes until 2 from default"
An overview of the branching strategy with grafted micro-releases. Click the image to get the emacs org-mode ditaa-source. Grafted micro-releases add another layer between development and releases. They can be necessary in cases where testing requires actually deploying a release, as for example in Freenet. If you want to add a separate review stage, you can use a review branch1819 into which you only merge or graft reviewed changes. The review branch then acts as a staging area for all changes which might go into a release. To use this extension of the branching model, just create a branch on default called review in which you merge or graft reviewed changes. The first time you do that, you update to the first commit whose children you do not want to include. Then create the review branch with hg branch review and use hg graft REV to pull in all changes you want to include. On subsequent reviews, you just update to review with hg update nextrelease, merge the first revision which has a child you do not want with hg merge REV and graft additional later changes with hg graft REV as you would do it for micro-releases.. In both cases you create the release by merging the review branch into stable. A special condition when using a review branch is that you always have to merge hotfixes into the review branch, too, because the review branch does not automatically contain all changes from the default branch. 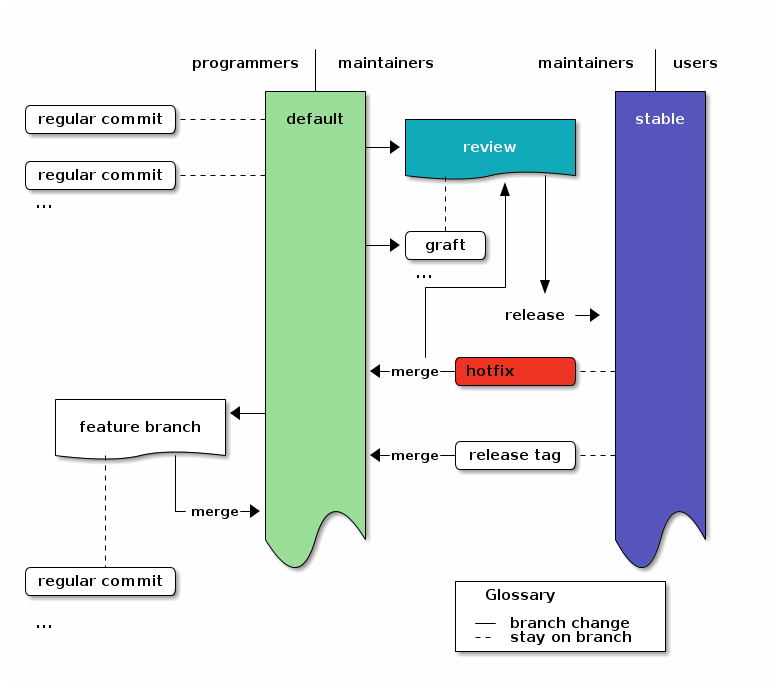 In the Diagram this just adds the review branch between default and stable instead of the release merge. Also it adds the hotfix merge to the review branch. An overview of the branching strategy with a review branch. Click the image to get the emacs org-mode ditaa-source. In the default flow when the users directly use the stable branch you do QA on the default branch before merging to stable. QA is a part of the maintainers job, there. If your users want external QA, that QA is done for revisions on the stable branch. It is restricted to signing good revisions. Any changes have to be done on the default branch - except for hotfixes for previously signed releases. It is only a hotfix, if your users could already be running a broken version. There is also an extension with an explicit review branch. There QA is done on the review branch. This realizes the successful Git branching model with Mercurial. We now have nice graphs, examples, potential extensions and so on. 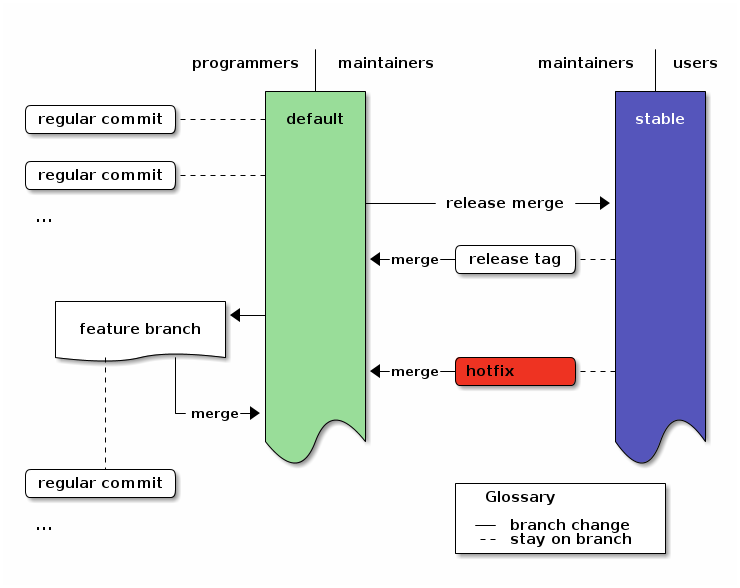 But since this strategy uses Mercurial instead of git, we don’t actually need all the graphics, descriptions and branch categories in the git version - or in this post. (1) you do all the work on default - except for hotfixes. You do all the work on default. If you look at the Git branching model which inspired this Mercurial branching model, you’ll note that its diagram is a lot more complex than the diagram of this Mercurial version. Tags are simple in-history objets, so we need no special branch for them: a tag signifies a release (down to 4 branch-types - and no more duplication of information, since in the git-model a release is shown by a tag and a merge to master). Hotfixes are simple commits on stable followed by a merge to default, so we also need no branch for them (down to 3 branch-types). And if we only maintain one release at a time, we only need one branch for them: stable (down from branch-type to single branch). And feature branches are not required for clean separation since mercurial can easily cope with multiple heads in a branch, so developers only have to worry about them if they want to use them (down to 2 mandatory branches). And since the default branch is the branch to which you update automatically when you clone a repository, new developers don’t have to worry about branches at all. So we get down from 5 mandatory branches (2 of them are categories containing multiple branches) to 2 simple branches without losing functionality. “If you use feature branches, don’t call them default or stable. And don’t touch stable”.